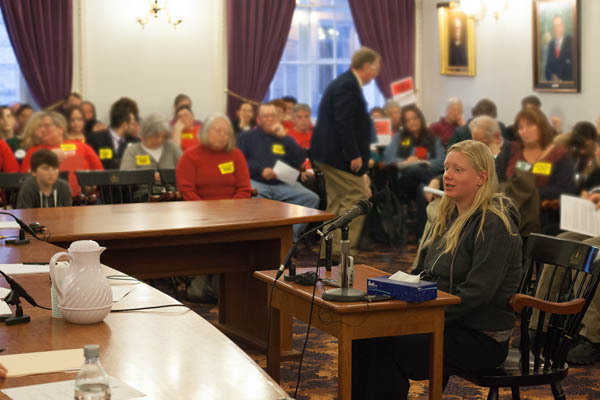 The Vermont House of Representatives held a public hearing last night to hear comments and testimony about H. 208, the Earned Sick Days Bill and homecare workers Mary Montgomery (Washington, VT) and Amanda Sheppard (Middlebury, VT) spoke in support of the bill. 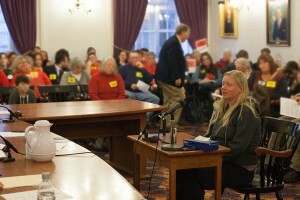 H.208 would afford everyone working in Vermont paid leave. Employees would earn one hour of paid leave for every 30 hours worked, up to seven sick days per year. The bill also allows an employee to take care of a sick loved one and obtain diagnostic, routine, preventative or therapeutic health care. 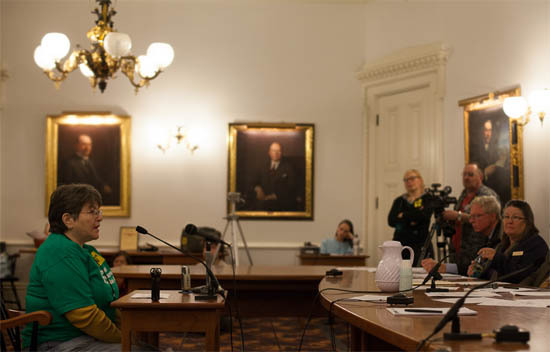 Mary Montgomery from Washington told the House Committee on General, Housing and Military Affairs that a law requiring some paid sick leave is just one way that Vermonters can ensure basic dignity for all working people. She is working to ensure dignity at work for homecare workers by fighting for the right to organize a union with AFSCME’s Vermont Homecare United. Amanda Sheppard from Middlebury tells the committee of her experience with jobs that had no paid sick leave. When she had jobs with paid sick leave, she and her family recovered faster and with little upset to family life. But without paid sick days, her son hesitates to say he is sick because it means added family stress, and she goes to work when she isn’t feeling well. The House is now hearing testimony on our homecare bill, S. 59. 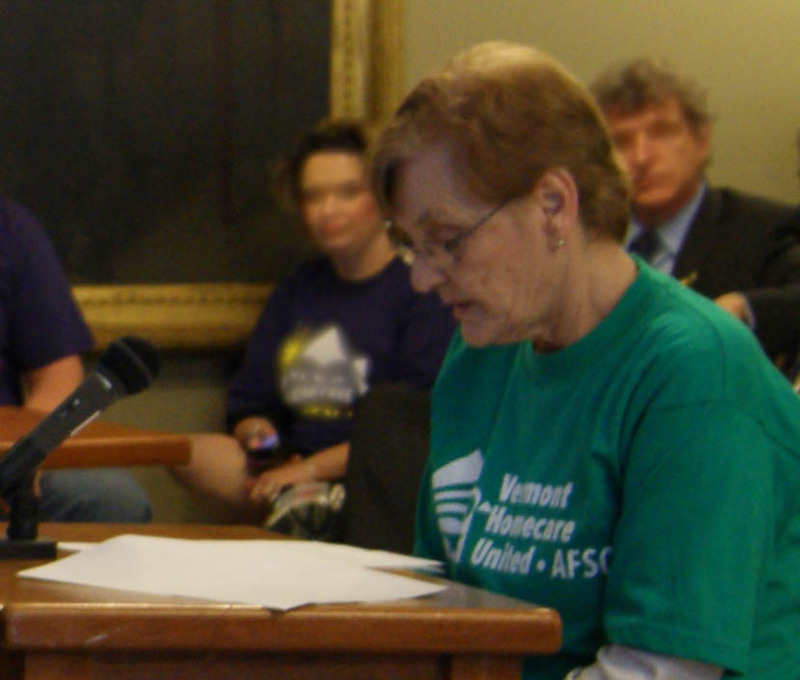 Homecare worker Carol Delage tells the legislators about her work and how the homecare bill will benefit her and her consumers. Homecare worker Carol Delage from St. Albans testifying Thursday on behalf of the homecare bill, S. 59, before the House Committee on General, Housing and Military Affairs. Vermont Homecare United/AFSCME joined with partners in the Put People First Campaign and Vermont Coalition of Disability Rights for the Disability Awareness Day 2013 (March 28) at the Vermont State House. Top, left is Max Barrows, Outreach Coordinator at Green Mountain Self-Advocates with homecare worker Louise Beaudoin from St. Albans. 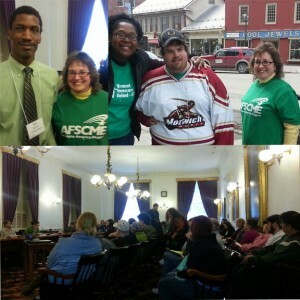 Top, right is homecare worker Patrick Willis from Montpelier in the center, with organizer Khalilah Karim to the left and homecare worker Louise Beaudoin on their way to the capitol building in Montpelier. Below is the whole group at the capitol for the keynote address, Moving Beyond the Barriers People with Disabilities Still Face 20 years after the Closing of Brandon Training School.